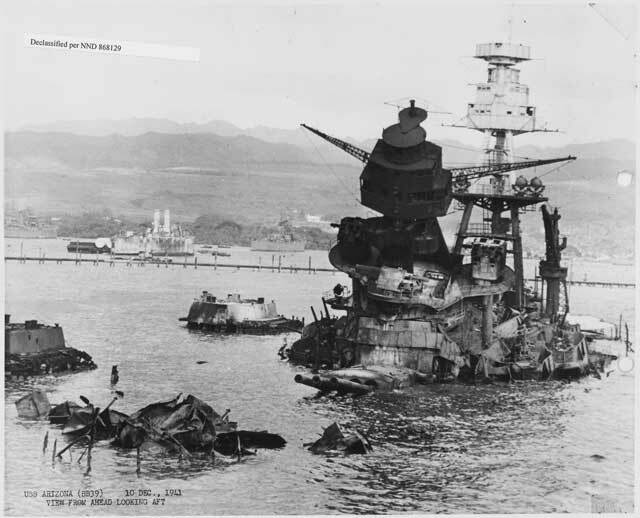 The wreckage of USS Arizona at Pearl Harbor, 30 December 1941. The superstructure seen in this picture eventually is cut off and dumped on nearby on Ford Island. It may still be there, but it in a restricted area. A hatch was removed and later taken to the Nimitz Museum in Fredericksburg, Texas. This photo likely was taken as part of the preparation for removal of safes and sensitive military information that began in early 1942. Incidentally, all photos showing damage at Pearl Harbor were classified for many years. Battle of the Pacific: In the Philippines, the American and Filipino troops are withdrawing as fast as they can from central and southern Luzon on 30 December 1941. The American 31st Infantry Division marches to Dalton Pass in central Luzon to cover these withdrawals while Filipino troops set up defensive lines in the Bataan Peninsula. The Japanese correctly read these Allied troop movements as presaging an American redoubt at Bataan and send 48th Division south as fast as it can to disrupt these Allied moves. A race develops between the Allied and Japanese troops to reach the entrances to the peninsula and secure them before the other side can. Soviet Army Group Center, at Orel. 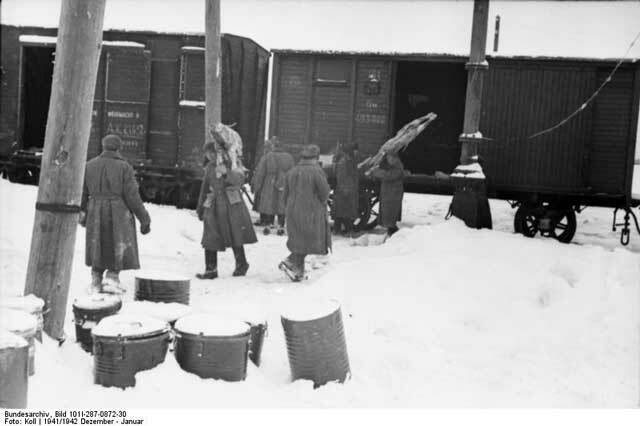 - Discharge of a wagon with provisions and loading of a truck using Soviet prisoners of war. Inscription on the right wagon: "Wehrmacht - AK Kursk"; Dec. 1941 / Jan. 1942. (Koll, Federal Archive Picture 1011-287-0872-30). Eastern Front: In the Crimea, Soviet landings at Feodosia and near Kerch have created a very difficult situation for the German 11th Army on 30 December 1941. Lieutenant General Hans Graf von Sponeck's 42nd Army Corps has only one German division, and he has withdrawn it entirely from the Kerch Peninsula. Generalmajor Kurt Himer, the 46th Infantry Division commander, has abandoned vast quantities of equipment in a hurried retreat through rain mixed with snow. Himer disregards the losses and simply flees to the west as fast as he can in order to save his men. This he does, but the division leaves a trail of abandoned vehicles and artillery in its wake. Altogether, the division loses 80% of its trucks, half of its communications equipment, two dozen artillery pieces, and nearly all of its engineer equipment. 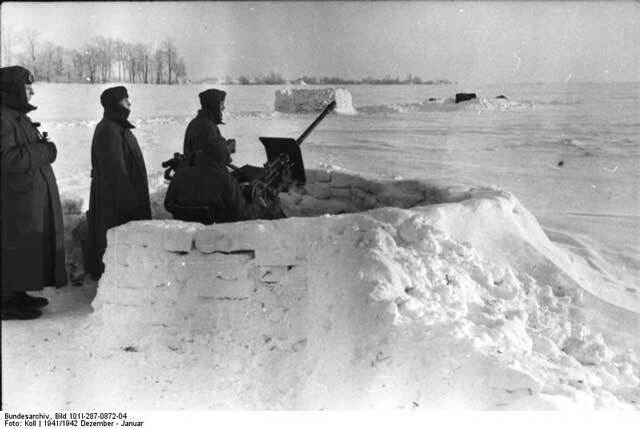 German gunners on the Eastern Front at Orel, December 1941/January 1942 (Koll, Federal Archive Picture 1011-287-0872-04). General Erich von Manstein, commander of the 11th Army, suddenly realizes the danger of an unchecked Red Army advance from Kerch. He transfers Sponeck to a quiet front (he later is sent to Germany for a court-martial) and begins shifting troops east from the Sevastopol perimeter. He orders 46th Division to stop retreating and to attack south toward Feodosia. 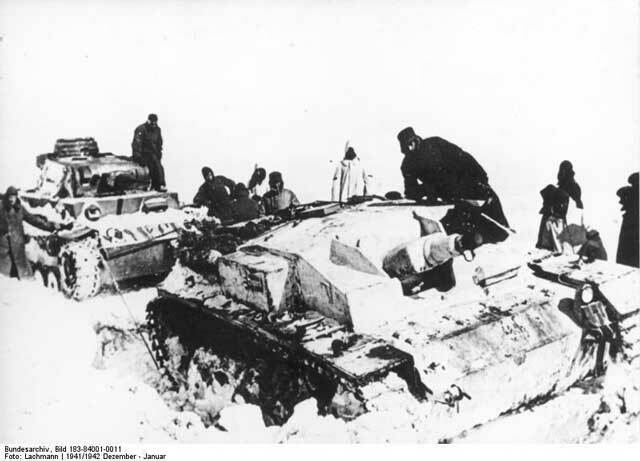 German armor (StuG III and Panzer III) in the Soviet Union, December 1941/January 1942 (Lachmann, Hans, Federal Archive Picture Bild 183-84001-0011). However, Himer's men have lost all of their offensive power and are heading to the northwest away from Feodosia on narrow country roads that do not permit a U-turn. Himer follows the order, but to little effect. The 40,000+ Soviet 44th and 51st Army troops that have landed in Feodosia, meanwhile, remains largely unopposed throughout the day. Soviet 44th Army advances to the northwest, toward Himer's fleeing remnants, while 51st Army heads east to secure Kerch. 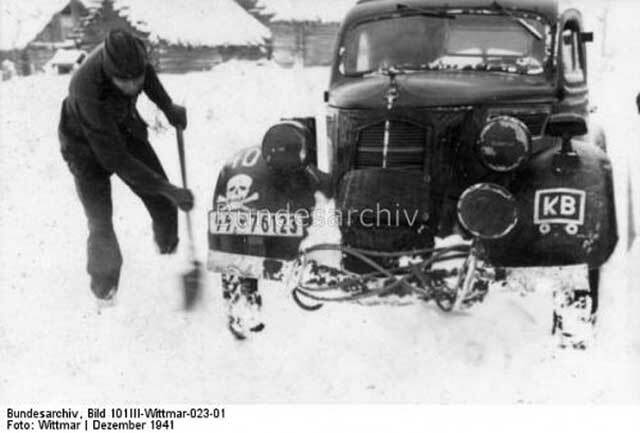 In Army Group North, a war reporter attached to the SS Totenkopf Division digs his car out after a snowstorm during December 1941 (Wittmar, Federal Archive Picture 101III-Wittmar-023-01). Around Moscow, the Germans continue to give ground. Army Group Center commander Field Marshal Guenther von Kluge calls Hitler at midday and renews his request for large-scale withdrawals. Hitler, however, will have none of it. He lectures Kluge, telling him that withdrawals simply "perpetuated" themselves. Once they begin, he argues, "one might as well head for the Dnepr or the Polish border right away." He tells Kluge to listen to "the voice of cold reason," which apparently means Hitler's own voice. As usual, Hitler refers to his own experience during World War I. 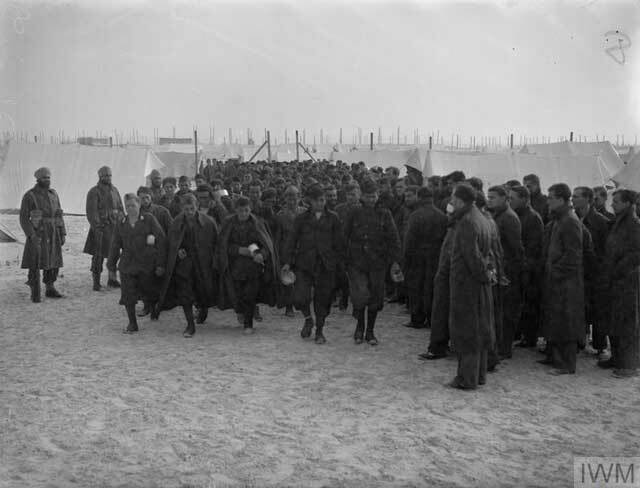 When Kluge boldly remarks that the situation is vastly different than in France during 1914 and that the troops are incapable of further resistance, Hitler snaps, "If that is so then it is the end of the German Army." Hitler then abruptly hangs up. 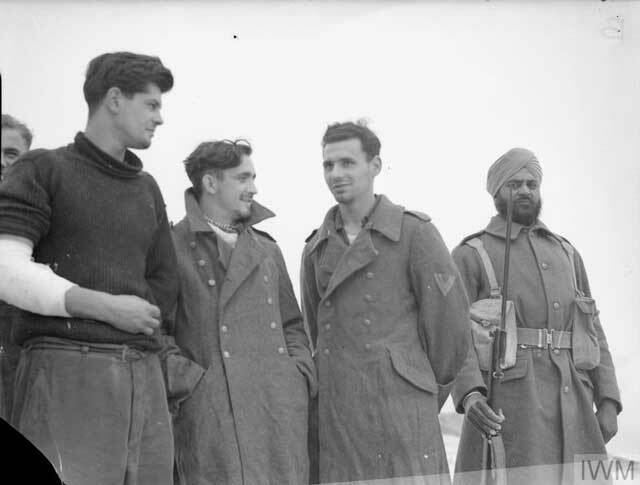 An Indian soldier guards German U-boat POWs at Agemi, Egypt, 30 December 1941 (© IWM (A 7990)). 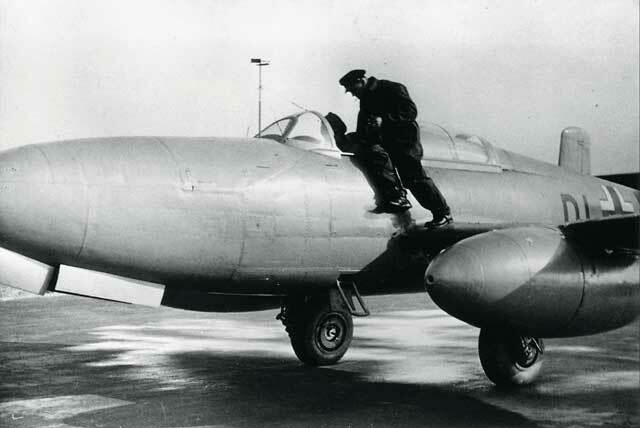 Later in the day, Kluge reviews messages from the front. Ninth Army reports that troops at Staritsa which are forbidden to withdraw have been almost surrounded, while Red Army units behind Ninth Army are heading south. Rzhev also now is at risk due to this advance by Soviet 39th Army. For the first time, it appears that the Red Army may be able to surround the entire Army Group if they push their breakthrough further to the south. Ninth Army commander General Adolf Strauß warns that a disaster may occur unless the entire mass of Army Group Center withdraws beyond the Soviet spearhead. "German U-boat prisoners on the right, watching Italian prisoners passing to their camp." Agemi, Egypt, 30 December 1941 (© IWM (A 7987)). Battle of the Mediterranean: British 22nd Armored Division of XIII Corps makes one more attempt to pierce the new Axis line and take Agedabia. However, the Germans now benefit from shortened lines and supplies flowing again through Tripoli and inflict heavy tank losses on the British. Following today's battle, British Eighth Army ceases offensive operations and both sides begin building up supplies for eventual offensive actions. Which side will prevail in future battles is entirely dependent upon supplies brought in by sea. While the Germans have great difficulty getting their supplies across the Mediterranean from Naples, it is a short sail and resupply can be very quick. The British, while they have fewer losses of supply convoys at sea than the Axis, have a much lengthier supply route and it takes much longer to build up a large force. As usual in North Africa, victory in the desert depends upon successes and failures at sea. 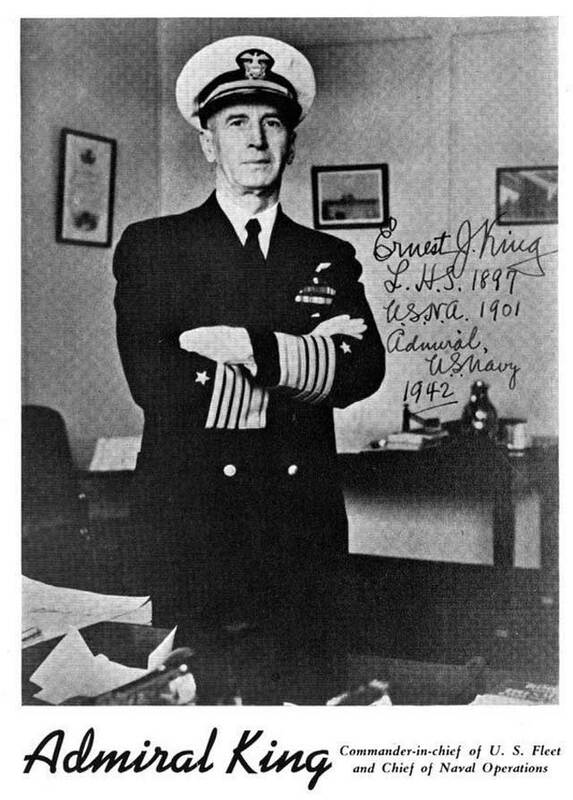 Admiral Ernest J. King, appointed to the command of the entire US Fleet on 30 December 1941. US Military: Admiral Ernest J. King, who has been Commander in Chief, Atlantic Fleet (CINCLANT), becomes Commander in Chief, United States Fleet (COMINCH). He replaces Admiral Husband Kimmel, who is in disgrace following the Japanese attack at Pearl Harbor. While King has been serving in the Atlantic, he believes that the Japanese threat is greater than others realize. King now is the main proponent in top Allied circles of allocating more resources to the Pacific Theater of Operations. This becomes a perpetual annoyance to the British, who argue that the defeat of Hitler is the top priority. King's first orders are to embark 5000 US Marines on transports at San Diego and send them to Samoa to protect US shipping lanes to Australia. British Government: During a two-day visit to Ottawa, British Prime Minister Winston Churchill addresses the Canadian Parliament. He gets off one of his more memorable lines. Referencing a comment made by Philippe Pétain that Germany would invade England and "have its neck wrung like a chicken," Churchill comments, "Some chicken! Some neck!" 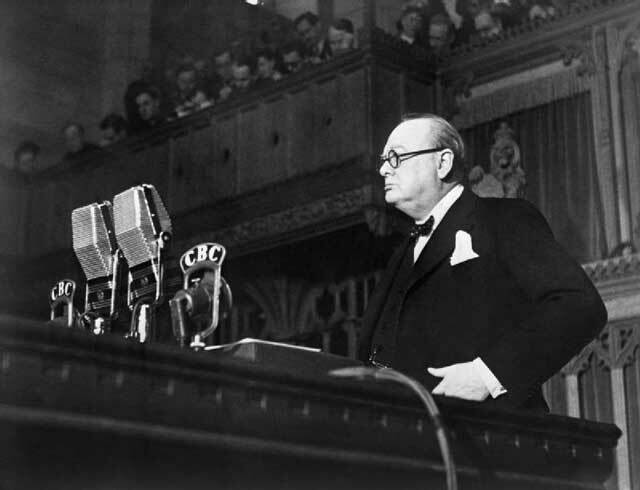 Winston Churchill addressing the Canadian Parliament in Ottawa, 30 December 1941.